Home Articles Newbie Just starting out? 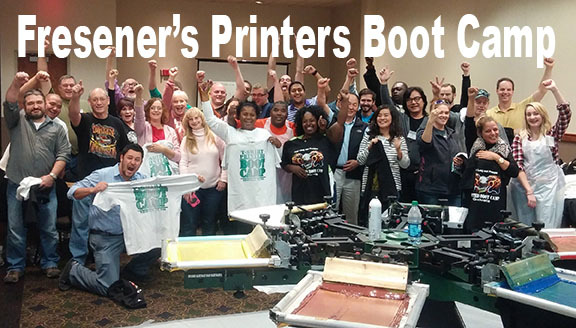 Come to a Printers Boot Camp! Are you just starting out? Come to Bowling Green Kentucky for three or four days and Mike Fresener will make you a GREAT printer! Classes are held every six weeks and they are hands on. You get to make screens, setup the presses, print LOTS of shirts including using special effects inks and more. Read more about it at www.PrintersBootCamp.com. Don’t put it off. These classes have changed the lives of thousands of printers from around the world. Watch a short video and see what you are missing. The video shows Nashville, TN and Scottsdale, AZ. The classes are now held in Bowling Green, KY in a permanent location.